The invention of the steam engine (which used coal and wood at first, with oil and natural gas coming later) seems to be the catalyst for change in the human race. 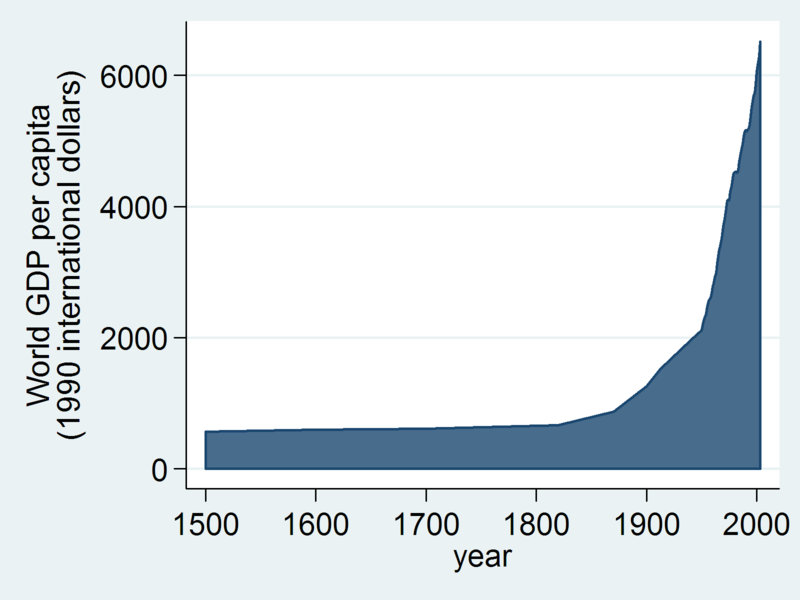 Now that’s a hockey stick we can all get behind! And then there’s this one, going all the way back to 500 B.C. The Great Famine started with bad weather in spring 1315. Universal crop failures lasted through 1316 until the summer harvest in 1317, and Europe did not fully recover until 1322. The period was marked by extreme levels of crime, disease, mass death, and even cannibalism and infanticide. The crisis had consequences for the Church, state, European society, and for future calamities to follow in the fourteenth century. Between the early 14th and late 19th centuries, a period of cooling known as the Little Ice Age chilled the planet. Europe bore the brunt of its ill effects, experiencing harsh and fickle weather for several centuries and especially from 1560 to 1660. Scientists continue to debate the cause and timeline of the cold spell, which has been blamed for catastrophes ranging from droughts and famines to wars and epidemics. According to the latest study, described by an international team in this week’s Geophysical Research Letters, volcanic eruptions just before the year 1300 triggered the expansion of Arctic sea ice, setting off a chain reaction that lowered temperatures worldwide. 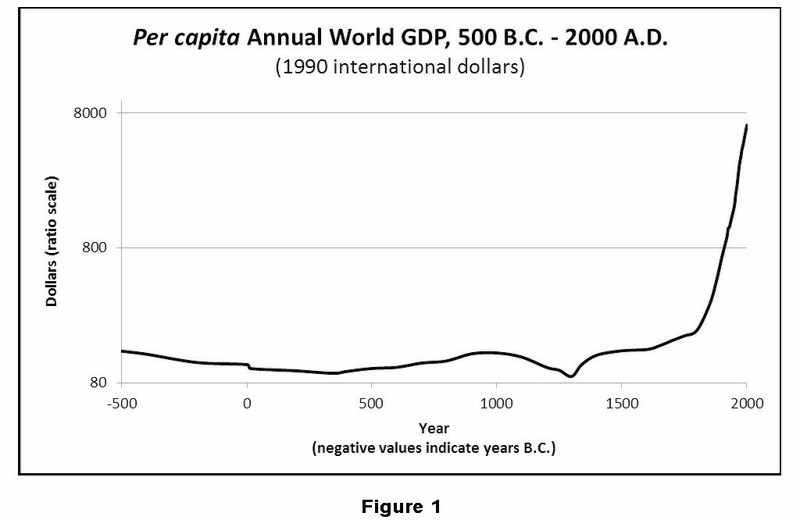 The Medieval Warm Period, lasting from about 950 to 1250, can also be seen on the graph. 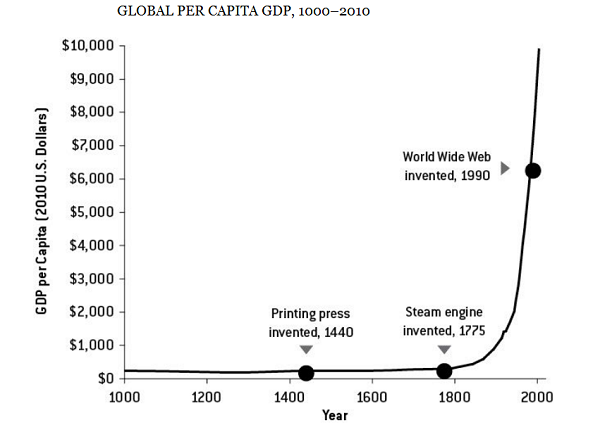 At around 1000 A.D., GDP peaked, then fell when weather turned cold and wet..
Then, the steam engine was invented, access to powerful yet inexpensive energy began, the industrial revolution took off, and the world never looked back. The next time somebody tells you how terrible things are today, primarily due to fossil fuels, show them this graph and ask them if they’d like to go back to the sort of conditions then.